During the programme I was able to gain two months’ work experience with a former lecturer, Dan Coxon, at the charity Young Devon based in Newton Abbot. During this time I applied and interviewed for a role at Leicester City Football Club (LCFC) as a CRM Marketing Executive which I was successful in securing and started the same month I submitted my dissertation. I was at LCFC for fourteen months before moving onto Wolverhampton Wanderers Football Club as Marketing Manager. 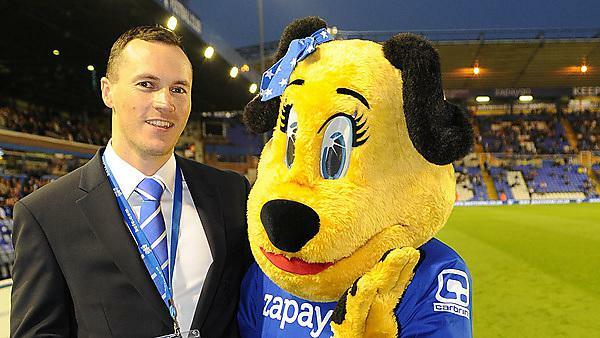 I stayed in this role for eight months before being hired in my current role at Birmingham City as Head of Brand and Marketing. Making a decision when offered a new role/opportunity. I have made a few steps in a short space of time, and some advised me not to; but you have to follow your gut and think of the longer term aims and think of each role as a step on a ladder. If you are a football fan there is nothing more fun than working on a new kit launch or working with the players on campaigns. Having access to the inner workings of a football club never wears off and you learn something new every day. To be honest, I have either been very lucky or have plotted the path perfectly. I think to be fair it is a bit of both! I’m really happy with how the programme and my subsequent career path has panned out, so wouldn’t want to change anything. Network, network, network! Football is all about who you know and getting a profile for yourself. Hammer LinkedIn and ask nicely, most people will be flattered and willing to help. I probably spend two hours a week speaking to students and helping them if I can. Before the programme I had zero marketing knowledge, so it transformed me from a blank slate to an employable marketing executive in twelve months. The trip to Reims in France was a lot of fun and added variety to the course. I also enjoyed working with a mix of people from all over the world. Absolutely yes; I couldn’t do my job today without it. It’s a well-taught programme by lecturers with a broad knowledge of the principle and its application. The one thing I always say to people is all things being equal (in terms of applicants, qualifications etc.) it’s the one who wants it the most and puts in an effort which goes above and beyond who will always win. When hiring, I always look for passion and hunger in an applicant: their qualifications get them in the room, but then it comes down to their sheer desire and showing how much they are willing to offer and do to be successful in the role. Tom Rowell talks about his career path since graduation, and offers advice to those looking to get into the same line of work.